ARE YOU A VICTIM TO OPTIMISM? YOU DON’T KNOW? THEN ASK YOURSELF THE FOLLOWING QUESTIONS. 1. DO YOU SUFFER FROM CHEERFULNESS? 2. DO YOU WAKE UP IN THE MORNING FEELING THAT ALL IS GOING WELL FOR THE ALLIES? 3. DO YOU SOMETIMES THINK THAT THE WAR WILL END WITHIN THE NEXT TWELVE MONTHS? 4. DO YOU BELIEVE GOOD NEWS IN PREFERENCE TO BAD? 5. DO YOU CONSIDER OUR LEADERS ARE COMPETENT TO CONDUCT THE WAR TO A SUCCESSFUL ISSUE? TWO DAYS SPENT AT OUR ESTABLISHMENT WILL EFFECTIVELY ERADICATE ALL TRACES OF IT FROM YOUR SYSTEM. To conclude: laughter and mockery and poking fun at authority have been part of the warp and weft of the British military psyche for centuries and it was singularly unlikely that so great a comic tradition would have nothing to say about the new circumstances of 1914-1918, however challenging they might seem. Came the danger, came the leg-pulls, the quips, the spoofs and the jokes. Came the suffering, came the cheerfulness. The outcome was a brilliant philosophy for the time, a philosophy to get men through everything, or almost everything, that the war could throw at them. THE WIPERS TIMES appears not only to have been permitted by the authorities, but also reprinted in Britain during the war. Here’s another example, this time a letter to the editor. Once again I feel constrained to draw your attention to the increasing rowdiness of the district. I am a peaceful citizen, and although somewhat behindhand with my rates, yet the injustice of the present conditions is apparent. Surely, when a quiet citizen wishes to cultivate his own small holding, it is not quite the thing to plant a 12-inch howitzer in the middle. I must protest, and if nothing is done in the matter, I announce my intention of voting against the present candidate at the forthcoming elections. From the comfort of my 21st Century bath-tub, the volume makes for pleasant reading. In the trenches, it offered indispensable ‘comic relief’ to both readers and contributors alike, as a fine example of British humour in the face of adversity. Another fine example in this same tradition was penned by P.G. Wodehouse, who spent part of the Second World War imprisoned in a German (civilian) internment camp. Young men, starting out in life, have often asked me ‘How can I become an Internee?’ Well, there are several methods. My own was to buy a villa in Le Touquet on the coast of France and stay there till the Germans came along. This is probably the best and simplest system. You buy the villa and the Germans do the rest. At the time of their arrival, I would have been just as pleased if they had not rolled up. But they did not see it that way, and on May the twenty-second along they came – some on motor cycles, some on foot, but all evidently prepared to spend a long week-end. Nevertheless, in spite of the interest of hobnobbing with our smell, we found time hung a little heavy on our hands. Arriving at Liège, and climbing the hill to the barracks, we found an atmosphere of unpreparedness. Germany at that time was like the old woman who lived in a shoe. She had so many adopted children that she didn’t know what to do with them. As regards our little lot, I had a feeling that she did not really want us, but didn’t like to throw us away. The arrangements for our reception at Liège seemed incomplete. It was as if one had got to a party much too early. Here, for instance, were eight hundred men who were going to live mostly on soup – and though the authorities knew where to lay their hands on some soup all right, nothing had been provided to put it in. And eight hundred internees can’t just go to the cauldron and lap. For one thing, they would burn their tongues, and for another the quick swallowers would get more than their fair share. The situation was one that called for quick thinking, and it was due to our own resourcefulness that the problem was solved. At the back of the barrack yard there was an enormous rubbish heap, into which Belgian soldiers through the ages had been dumping old mess tins, old cans, cups with bits chipped off them, bottles, kettles and containers for motor oil. We dug these out, gave them a wash and brush up, and there we were. I had the good fortune to secure one of the motor oil containers. It added to the taste of the soup just that little something that the others hadn’t got. I quote from these broadcasts at length because they are so often referred to, but too little read or appreciated as part of the tradition to which they rightfully belong. By the time of the fourth broadcast, Wodehouse had learned that his gently amusing account of life as an internee was not entirely appreciated in Britain. What had happened to the great British sense of humour in the face of adversity? This affair has been much written about, particularly since the relevant MI5 documents were made public three years ago. The consensus is that Wodehouse’s radio broadcasts from Berlin, made after his release from internment, were innocent in both content and intention. But it suited the political (and private) purposes of a handful of people to make an issue of his broadcasting from Germany. Few people in Britain actually listened to the broadcasts, and accepted the anti-Wodehouse propaganda. The resulting stain on his reputation has been shamefully slow to lift. I still meet people who believe Wodehouse was a Nazi sympathiser. So I’ve cut short my bath today to add my voice to many who have written on the subject. It is not enough that Wodehouse has been exonerated. It is time he was recognised as part of the wartime humourist tradition to which he belongs. You can read the full broadcasts here. Although I’ve always exonerated Wodehouse from being a Nazi sympathiser, I’ve remained surprised at his naivety in making the broadcasts. From the first broadcast, the way he describes the German soldiers as jolly nice people on the whole and uses words like ‘fraternize’ shows a real lack of understanding of the feelings of people whose relatives were being killed by German soldiers. I know my own father, who fought throughout the whole war, had a bitter hatred of the Germans that never fully dissipated. It’s easier for those of us who weren’t there, and who can see the whole thing more objectively, to exonerate Wodehouse, but the reaction to the broadcasts was fairly understandable at the time, I feel. The feelings you describe are entirely understandable, although it wasn’t the ordinary people of Britain, or even soldiers, who reacted angrily to Wodehouse’s broadcasts (some servicemen who heard them were quoted as enjoying them, and expressing surprise that the German’s had permitted him to make them). 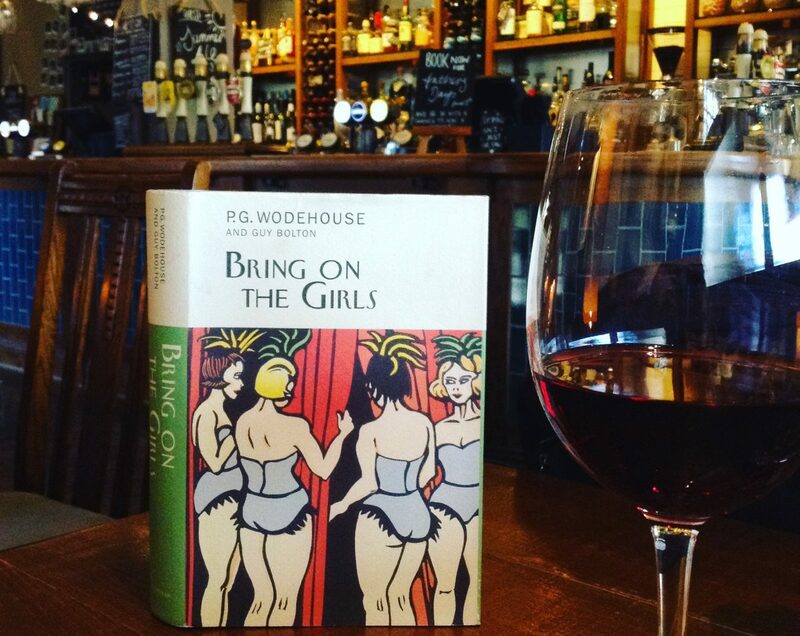 The reaction to Wodehouse was a calculated, political one – and the public response that followed was entirely orchestrated to suit this purpose. However discomforting it may have been for some people at the time, Wodehouse wasn’t the first or the last writer to credit his captors/enemy with some redeeming human qualities. I think it tends to show him in rather a good light. But as you say, this is a much easier judgement for me to make, some 60 years later. For those who idealize him, such insinuations simply amount to a blasphemy of sorts! Well they certainly sting, that’s true, I want to be open-minded in the face of the facts, but fortunately the facts stack up in Plum’s favour. never understood how the malignant idiocy of that ‘cassandra’ fellow was taken seriously. in the most trying moment of his life (& his country’s), wodehouse retains an insouciant, jaunty, self-mocking, quintessentially english sense of humour. is there a better example of “englishness” (as it was), or of the typically english (unperturbed, off-hand) response to adversity?